In the first part of this post, I discussed the chequered history of Article 1(4) of Additional Protocol I to the Geneva Conventions. This provision has elevated so-called “wars of national liberation” to the level of inter-state armed conflicts as far as international humanitarian law (IHL) is concerned—albeit only for the parties to the Protocol. The rule was so controversial in the 1970s that it nearly prevented the adoption of the Protocol itself, but then it paradoxically languished for decades without practical application. Even so, was it really destined to become a dead letter, as some have argued? This is a good moment to mention the sister clause to Article 1(4), namely Article 96(3) of the same Protocol. This latter provision grants the non-state party to a war of national liberation (that is, a “national liberation movement”) the right to issue a declaration by which that party undertakes to apply the Geneva Conventions and the Protocol in relation to the conflict in which it is involved. If successfully made, the legal effect of such a declaration is to bring those instruments into force for the said national liberation movement. Afterwards, there would be little doubt that the conflict in question qualified as one to which Article 1(4) applied, and therefore it could be accurately described as an internationalized armed conflict. However, in order for any such declaration to be successfully made, it would have to be accepted by the depositary of the Protocol. As for nearly 80 other international treaties, this role is performed by Switzerland. Historically, communications that were either expressly styled as Article 96(3) declarations or contained formulations similar to those used by the provision have in fact been made on multiple occasions. These have included declarations issued by the African National Congress in 1980, the Palestinian Liberation Organization in 1989, and the National Democratic Front of the Philippines in 1996. However, until very recently, no such declaration had been accepted by the depositary. In June 2015, Switzerland surprised a few of those paying attention by issuing a brief notice, in which it stated that a unilateral declaration deposited by the Polisario Front just a few days prior “ha[d] … the effects mentioned in Article 96, paragraph 3, of Protocol I.” Perplexingly, it did not provide any further legal reasoning to justify this evaluation. I was more than intrigued: given the language of Article 96(3), accepting the declaration seemed to mean that Switzerland, in its capacity as the depositary of the Protocol, considered that the situation in Western Sahara qualified as a “war of national liberation” in the sense of Article 1(4). This would have a dramatic impact: an entire, heretofore theoretical, modality of internationalization would suddenly come to life. …this example shows that once a legal provision is on the books, it takes on a life of its own. Importantly, unlike other past adversaries of national liberation movements around the world, Morocco is a contracting party to the Protocol, having ratified it in June 2011. Therefore, the memorandum concluded, the depositary had no choice but to accept the declaration and notify it to all contracting parties of the Conventions and the Protocol. For good measure, it even confirmed that this was an unprecedented decision: the document expressly stated that “[t]his is the first time that [the depositary] received such a declaration meeting all these criteria”. The document thus put some meat on the bare bones of the official notice, making it better understandable for researchers and practitioners in the field. So where does that leave us? This brief exploration allows for two main observations, a narrower and a broader one. The narrow observation is that there is now a solid case for qualifying the situation in Western Sahara as an armed conflict internationalized by way of Article 1(4) of the Protocol. In other words, the controversial rule originally drafted in the mid-1970s has suddenly been revived four decades later, thus belatedly confirming the practical viability of a specific type of conflict internationalization. In addition, there is also a broader observation to be made. To paraphrase the legendary Mark Twain’s (mis)quote, we can now see that the reports of the death of Article 1(4) have been at least slightly exaggerated. To put it differently, this example shows that once a legal provision is on the books, it takes on a life of its own. Even if its content may at one point start to look archaic or obsolete, until it is repealed, its capacity to apply to novel circumstances may come as a surprise, on occasion even to its own authors. Featured image credit: Flags by 495756. CC0 via Pixabay. 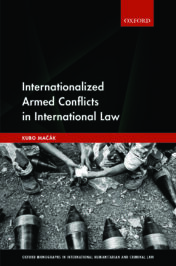 Dr Kubo Mačák is a senior lecturer in law at the University of Exeter and the author of Internationalized Armed Conflicts in International Law, a new release from Oxford University Press.